The City of Scottsdale wants to create more water wonks. Scottsdale Water is giving 20 residents an opportunity to explore the science, engineering and labor it takes to keep water running day and night to and from homes and businesses. The City's inaugural six-week Scottsdale Water Citizens Academy began March 30. Scottsdale Water is taking a lesson from popular police and fire academies by giving customers an inside look at operating a water system. In turn, the City hopes customers will better understand the value they gain from what they pay for water. Classes are two hours each Wednesday evening. Participants meet the people who clean and recycle their water every day. 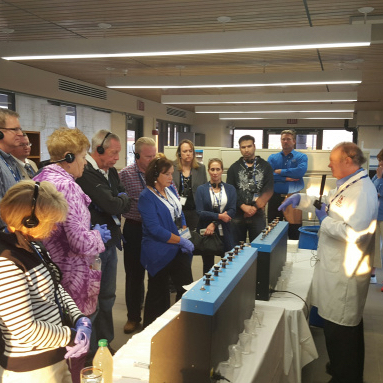 The course includes presentations, tours, demonstrations and a few hands-on science experiments. Here are the tours that are part of the course. The CAP Water Treatment Plant is Scottsdale Water’s largest drinking water treatment plant. It processes up to 70 million gallons of drinking water every day. The Central Groundwater Treatment Facility is cleaning up a Superfund site, which is a polluted location that requires long-term cleanup of contaminants and is overseen by State and Federal agencies. The facility uses what is called an “air-stripping process” to clean groundwater from the North Indian Bend Wash Superfund site. The water is cleaned to exceed federal drinking water standards. The Water Quality Laboratory is one of the most advanced municipal water laboratories in Arizona. Lab employees make sure the water that reaches customers meets or exceeds local, state and federal drinking water standards. They also test for unregulated contaminants to remain ahead of future regulations. The Advanced Water Treatment Facility can turn wastewater into ultrapure recycled water at the rate of 20 million gallons per day. The water produced is used to irrigate golf courses and to store underground for the future. The WateReuse Research Foundation and the Australian Water Recycling Centre of Excellence have called the facility one of the world’s most innovative water purification projects. Yes, there is more. Participants will see a piece of exposed underground infrastructure as an example of the system that operates 24/7 under our feet. The demonstration site includes an unearthed water main with a line leading to a fire hydrant and a service line that leads to a home’s water meter. Scottsdale Water employees will show participants how a water main is fixed and will disassemble a water meter to demonstrate how it works and how the City reads it. Demonstrations also include one of the robots that carry cameras into sewer lines for routine inspections and a vacuum truck that helps to keep everything tidy while work is being done. Sound interesting? Then you’ll want to watch the Scottsdale Water website for updates about next year’s application. Attending the course would certainly add to your water wonk credentials. At the least, it could lessen the panic surrounding your student’s next annual science project.